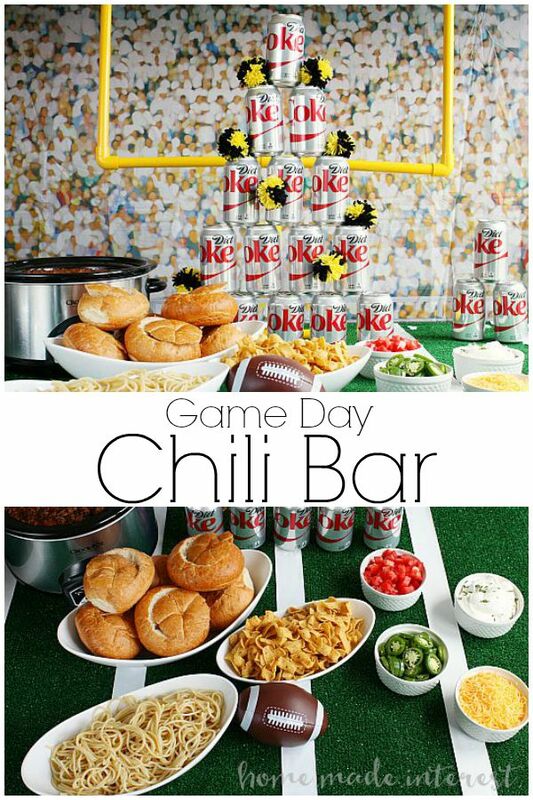 Game Day Chili Bar - Home. Made. Interest. 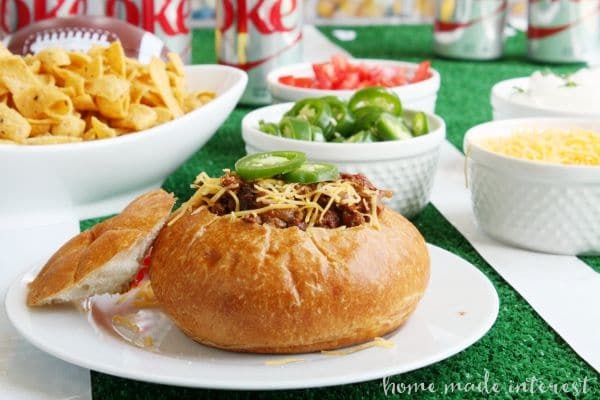 On Game Day there is nothing better than a Chili Bar for feeding your hungry crowd at halftime. Football season is about to begin and my husband already has all the important game days marked on the family calendar. We take that stuff pretty seriously around here! He tries to attend as many of the home games for his favorite team as he can, and when he can’t make it to the game we like to do a little homegating at our house. Have you heard of homegating? It’s like tailgating except you do it in your living room instead of the parking lot at the stadium! We have friends over to watch the games a lot during the season and I’ve already started pinning recipes and coming up with ideas for what to make. You know me I’m all about a party so I like to make everything look good. I have the field goal that I made last year and I whipped up a few more yarn pom poms for this year. 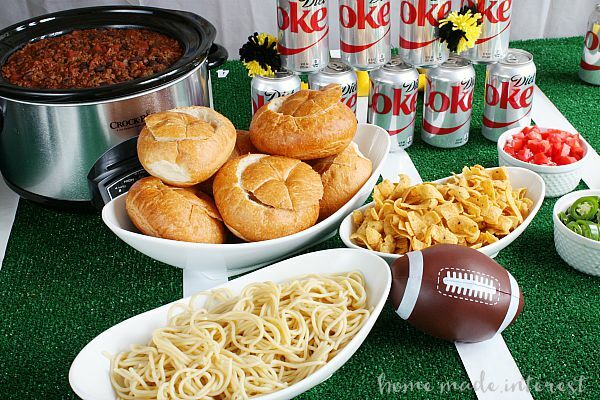 When I think of game day food I think of halftime. That’s when everyone gets up to grab something to eat. 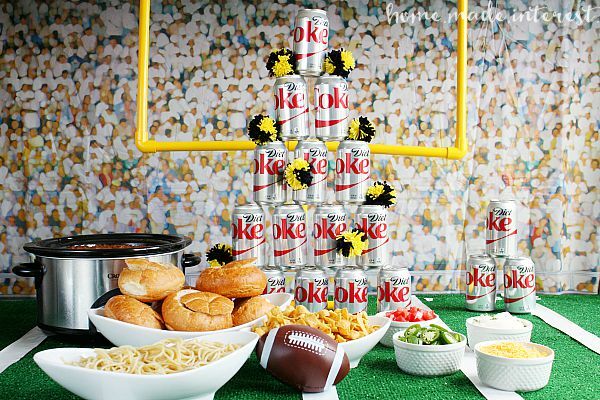 I’m going to be putting on my own little halftime show over on the food table with a pyramid of Coke cheerleaders in the center of the table, shaking their little pom poms. 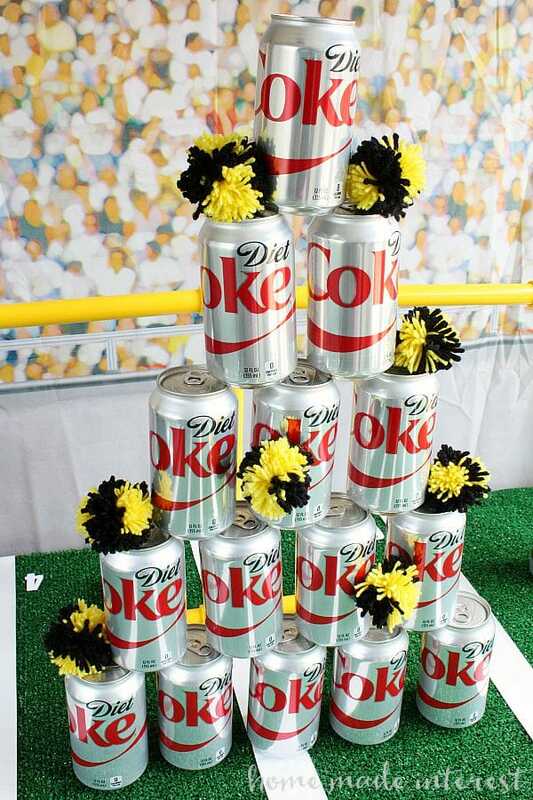 I usually make a trip to Sam’s Club and load up on 28 packs of Coke and Diet Coke, so stacking the sodas up on the table is both cute and functional! The star of the halftime show is going to be a chili bar. The only thing better than chili is getting to customize it. So, this year I’m setting up a chili bar with things to put your chili on (i.e. noodles, bread bowls, corn chips, etc.) and things to put on your chili (i.e. sour cream, cheese, diced tomatoes, jalapenos, etc.). 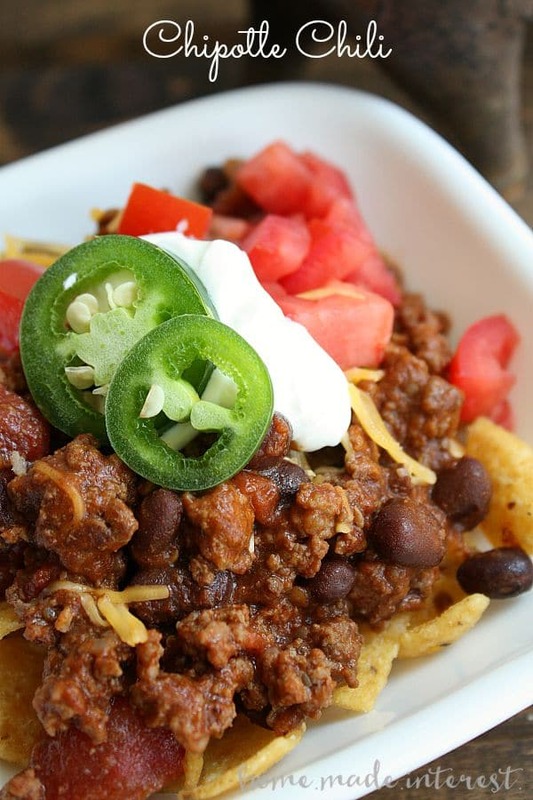 You can use your imagination when it comes to add-ins for chili. I picked some of my favorites and set them up on the table along with a big slow cooker full of Kat’s Smokey Chipotle Chili. That stuff is good! 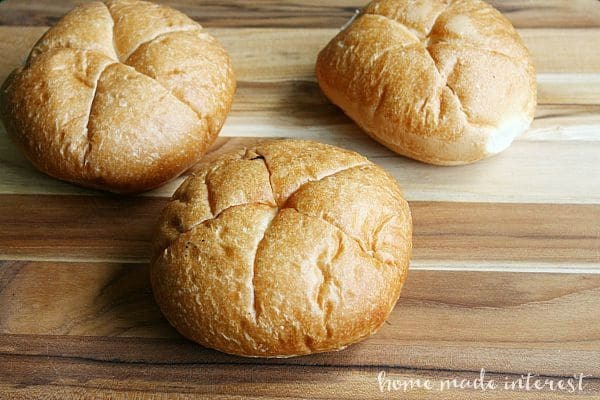 I can’t choose a favorite because they are all so good, but I do love the mini bread bowls. They were easy to make. I just bought a firm, round bread (sourdough is most commonly used) at Sam’s Club. They have them in big packages, perfect for parties! Then I used a serrated knife to cut a circle in the top. 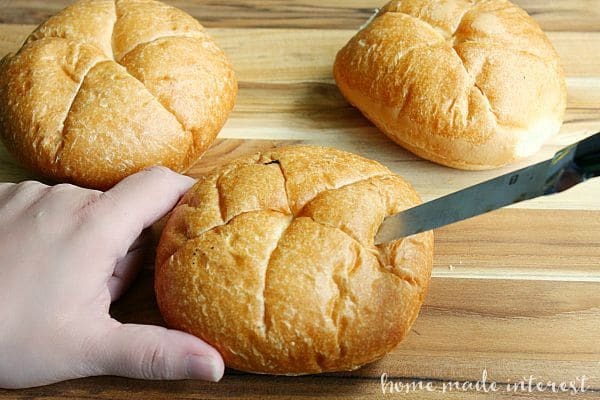 Make sure the knife goes in at an angle so you get a big hole at the top of the bread without cutting through the bottom of it. You don’t want that chili leaking out all over everything. 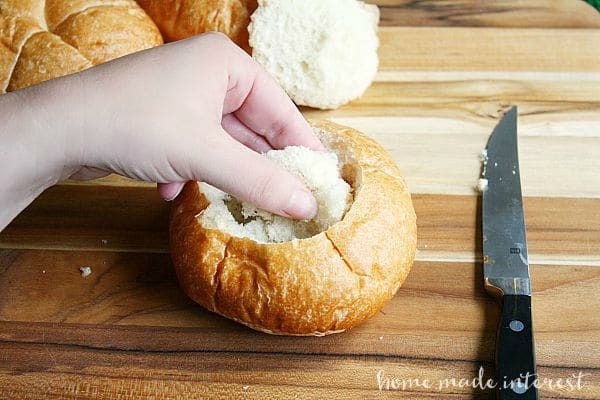 The I removed the top and scooped out the inside of the bread bowl. Don’t pull out so much of the inside of the bread that you go through the sides, again, we don’t want leaking. You do want to open up enough space inside that there is plenty of room for chili! This is what you end up with. Looks good right? When I’m putting my chili in the bread bowl I heap most of the topping in first then ladle the chili on top of it. That way things don’t go slipping off the top when I eat it. Now you just need the chili recipe! One of the many things I love about chili is that it only tastes better if you make it a day ahead of time. So I can make a big pot the day before people are coming over, then on game day I put it in my slow cooker in the morning and let it warm up before the party. 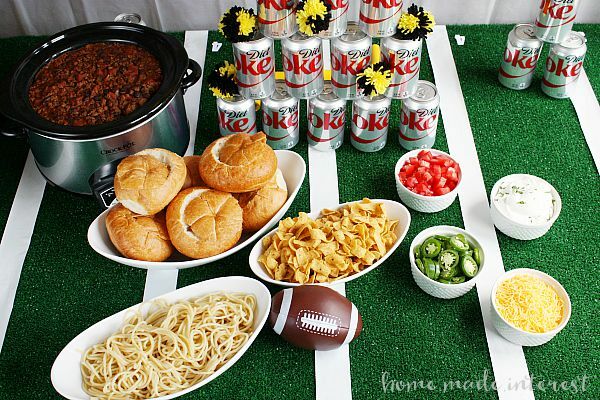 I can also make the spaghetti noodles and bread bowls the day before the party so on game day all I have to do is put everything in a bowl, set up my pyramid of Cokes and Diet Cokes, and I’ve got a fun halftime show table, that is sure to please the hungry crowd. That leaves me plenty of time to watch the game with friends instead of cooking in the kitchen. Win! Brown ground beef in batches adding salt and black pepper as you go. Set to the side. Sauté onions, garlic, Serrano pepper and jalapeno peppers until onions are translucent. Add diced tomatoes, black beans, the rest of the chili seasoning and the rest of the chipotle in adobo. Let simmer for 15minutes. Add red wine vinegar. Let simmer for 30 minutes. Just before serving add cilantro mixing in well. When it is time to stock up for your game day party don’t forget about Sam’s Club easy Order Online and Pick Up in store feature. You can go to Sam’s Club online, order whatever you need for your party (don’t forget the 28 packs of Coke and Diet Coke!). Then you can go pick it all up instantly in store! Pretty cool right? 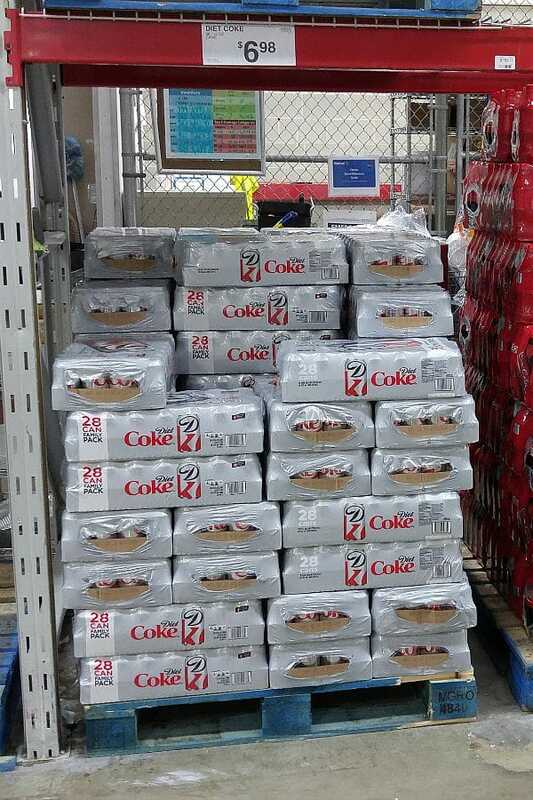 Don’t forget to order 28 packs of Coke and Diet Coke from Sam’s Club for your next party! You guys this looks so good! We have been feeling a little yucky at our house with a little battling a bad ear infection. This might be just the thing we need! This chili looks tasty! Found you on Marvelous Monday! This looks delicious! I need to make a chili bar STAT! Great game day idea!! Pinned! Thanks for sharing this idea but more importantly thank you for sharing your recipe! 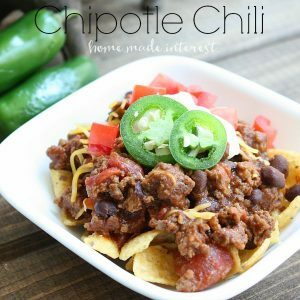 Smokey Chipotle Chili sounds amazing, I cannot wait to try it. I’m sure it will be a hit for the next game day party I host. 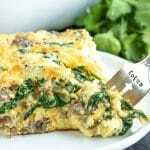 If your looking for some recipes your guests might enjoy check out my Pinterest page!